6.5 mm wide and 19.5 cm long. The bracelet is also available with the stories TRIBUTE TO FASHION and MAJESTIC ART. 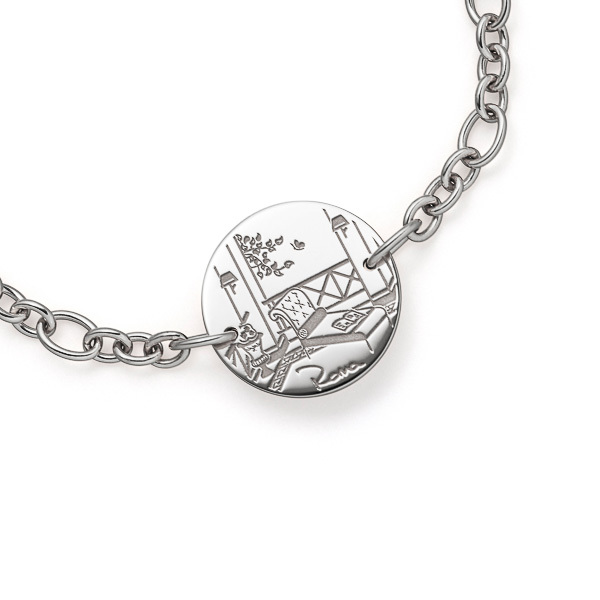 The bracelet is an expression of joy and timeless elegance with its stylish, hand-drawn scene of urban lifestyle and its clear, straight-lined form. Due to its harmonious design, it works equally well as a statement piece or as a basic piece to combine with other favorite jewelry. 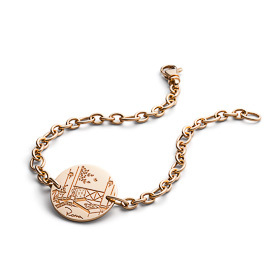 The gold plate with the drawing is integrated into an asymmetrical anchor chain with a standard length of 19.5 cm. However, the length of the chain can be customized. Please contact us for an individual adjustment. 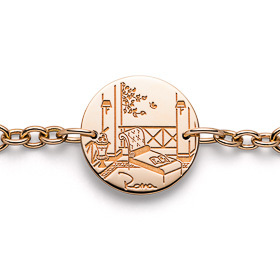 The pictures show the bracelet with the scene URBAN SUMMER. Binding for the order is your choice of scene and material. Enjoy selecting your style!